In this entertaining, if repetitive, collection of daily rituals of nearly 200 of some of the greatest minds of the last four hundred years, you’ll hear the daily routines of famous writers, thinkers & artists. I listened to the book on Audible, usually during short driving trips. 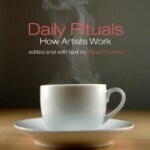 Here’s the link if you’d like to buy the Daily Rituals Book for yourself or as a gift. Among other things, this book will make you feel better about your own procrastination and odd habits!